It’s hard to believe that the Ottawa 67’s hadn’t made a visit to Kingston since November 28th when they played in the annual school day game. 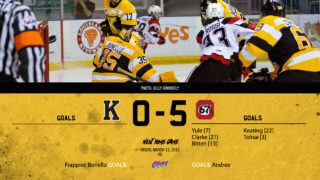 The lack of visits meant that Frontenacs fans would see a lot of the 67’s over the next few weeks. They are the Frontenacs opponent in three of the final six home games this season. 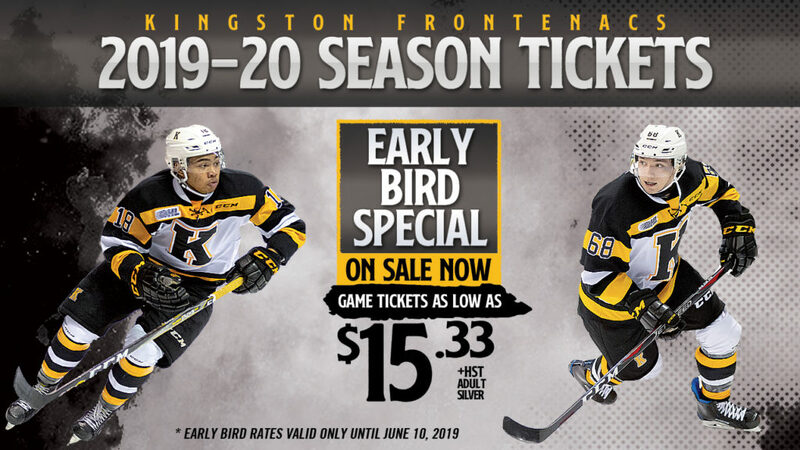 The Frontenacs also make one more trip to Ottawa before the end of the season. 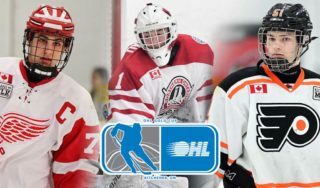 On Wednesday night Kingston was looking for their first win of the season against their long-time division rival. The game kicked into high gear early when Kallaway Mercer and Alec Belanger dropped the gloves and had a spirited bout just two minutes after puck drop. Belanger completed the second part of a Gordie Howe hat trick attempt at the ten-minute mark when he recorded an assist on the opening goal of the game. It was Sasha Chmelevski who had the snipe to put the 67’s ahead 1-0. Nick Wong answered back for the Frontenacs with a snipe of his own. His game tying goal was unassisted at 17:18. With under a minute to go in the period, Sasha Chmelevski had a great opportunity for his second of the game. Marshall Frappier stayed with him, but was out of position when Lucas Chiodo pounced on the loose puck to tap it in. The late goal gave the Ottawa 67’s a 2-1 lead after one period of play. Ottawa continued to pour pucks on net in the second period and they were rewarded with a couple of goals. Austin Keating had a beautiful tip on a point shot during a 67’s power play. 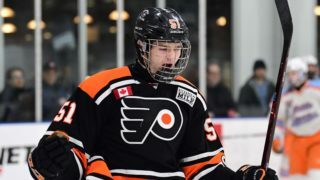 Just minutes later Merrick Rippon showed off some impressive hands when he made his way through a couple of defenders and lifted a back hand shot over the shoulder of Marshall Frappier. Brendan Bonello replaced Frappier after Ottawa’s fourth goal and shut the door for the remainder of the second period, but the Ottawa 67’s had already built a 4-1 lead with just one period remaining. 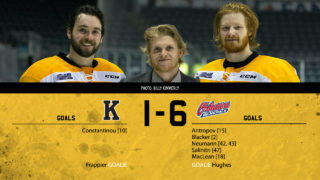 The Frontenacs made a valiant effort to comeback in the final period. 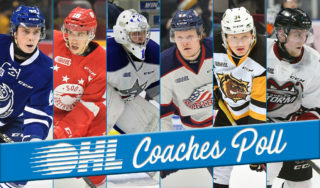 Their hard work led to multiple power play opportunities. Nick Wong capitalized on one of them for his second of the game. That goal was followed by a 5 on 3 power play that resulted in a shooting gallery for Kingston but Will Cranley held them off the board. 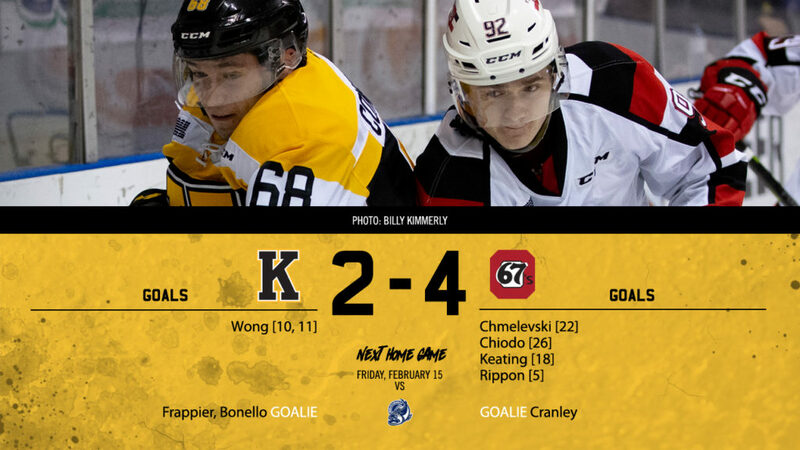 The 67’s penalty killing held up enough to send them home with a 4-2 victory over Kingston.